The Moscow-based International Investment Bank is moving its headquarters to Budapest. The Hungarian Parliament debated the international agreement establishing the bank's new headquarters yesterday - there are a number of alarming details. The proposition to introduce the new international agreement with Russia into the Hungarian legal system contains a number of unusual details that provide a number of extra rights for the International Investment Bank (IIB) that is the legal successor of the Comecon and the bank of the former Soviet economic organisation. Apart from the specifications of the buildings the Hungarian state provides to serve as the new headquarters and other facilities of the IIB, the agreement stipulates that all costs are to be paid by the Hungarian taxpayers – including refurbishings, rent, and security. The agreement contains a number of immunities that make sure that the Hungarian state will not be able to as much as enter the building without prior authorisation, as IIB will be granted similar legal standing as diplomatic missions and offices of international organisations. The state is supposed to provide security by stationing a "sufficient number" of policemen at the offices, but they will not be able to go in as long as they are not specifically invited in by the IIB. immune to all restrictions, regulations, control and moratoriums. Any and all obligations to register or acquire prior authorisation for their activities. Any and all legal procedures carried out by the Hungarian administration or the judiciary except for cases where the Bank had waived its immunity. Any and all taxes, duties, or export-import restrictions. If Hungarian law stipulates special authorisation for a certain activity, IIB has to be regarded as "having the required special authorisation, permission, or legal standing." All activities and properties of the bank will be immune to "
IIB's staff and their families will be enjoying full diplomatic immunity, but Hungary will also have to ensure that IIB's guests ("advisors and experts acting in the Bank's interest") would be able to enter the country "with no regard to their citizenship", along with"guests invited by the Bank who can present any written evidence of their invitation, including digital evidence of such an invitation," and Hungary will be obliged to provide diplomatic immunity to those dealing with the bank. In practice, this means that IIB will be able to bring virtually anybody into the EU. All the government asks for are the names, and they will start printing the ID cards and other documents that ensure that all affected can enjoy all "privileges and immunities" they are entitled to enjoy. Varga Mihály Minister of Finances (r) and Nikola Kosov (l), the head of the International Investment Bank signing their intention to move the regional office of IIB to Hungary back on 18 June 2018. Why did the Hungarian government accept these terms? The proposition's detailed reasoning contains no explanation whatsoever. 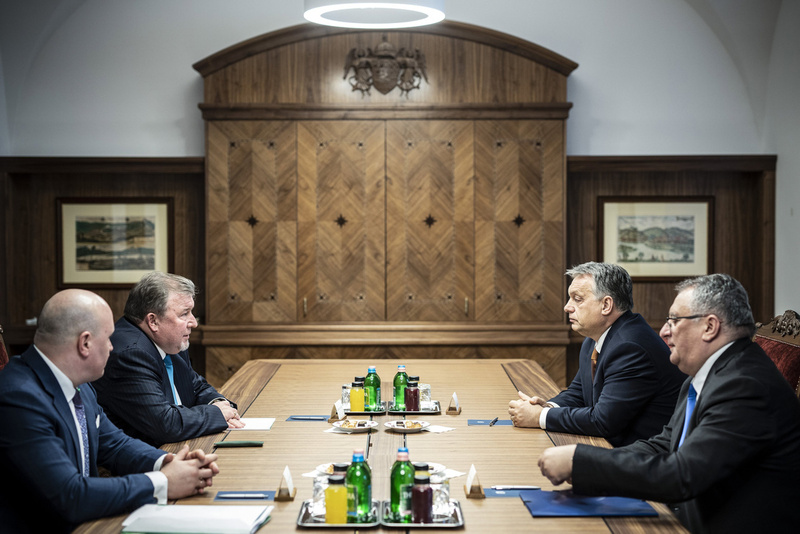 According to a news snippet from the end of January, the main point on the agenda of the meeting between Prime Minister Viktor Orbán and IIB's president Nikola Kosov was the conditions of IIB's move to Budapest. The government's position is that IIB establishing its new headquarters in Budapest will enhance the profiles of Budapest and Hungary as an "international financial hub," though there is no further clarification as to what that means: First of all, there are currently no supranational development banks in the region, secondly, as opposition MP Zita Gurmai pointed out in the Parliament, IIB's balance-sheet total is only 2.5% of Hungary's largest bank, OTP, and that would only make IIB the 17th largest bank in Hungary - but no other banks are granted such special immunities. Gurmai called IIB "Putin's trojan horse," and said there are no guarantees that this will not grant people with disputed national security risks access to Hungary, and she claimed the text only proves that "Fidesz succumbed to the will of Russia, and are now rolling out the red carpet for Putin's people." The bank is set to open in the second half of 2019, and the HQ will finish the complete moving procedure within two or three years. The government's position was made clear by Gábor Gion, state secretary of the Ministry of Finances. He said that IIB is registered at the United Nations as a multilateral development bank, and it receives all privileges and immunities that are granted to the other five such banks based in the European Union. He said that five EU member states (Bulgaria, the Czech Republic, Slovakia, Romania, and Hungary) hold 50.16% of IIB's shares, while Russia only holds 40.03%. Mihály Varga, Minister of Finances (r) and Nikola Kosov (l), the head of the International Investment Bank signing their intention to move the regional office of IIB to Hungary back on 18 June 2018. However, IIB's European expansion clearly serves Russian interests, as their long-term goal is to establish a financial system that could contend with its Western counterpart dominated by the United States. However, their appearance in Hungary serves the interests of Fidesz just as well, as IIB opens a way to provide financial support for projects that the EU is not willing to back, and as it is a multilateral institution not under the jurisdiction of a single country, so the bank can provide Russian loans because it is unaffected by the sanctions introduced against Russia for the annexation of Crimea. As Zita Gurmai called attention to it during the debate in the Parliament, IIB previously provided loans for MET group´s acquisition of a regional natural gas distributor, and as she said it, in return for the "red carpet" the government rolled out for the Russians, the bank that is untouchable for Hungarian authorities might be likely to finance those dreams of Fidesz oligarchs that Europe is not willing to pay for. This article is the English summary of the original published by Index in Hungarian.